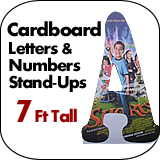 7 Foot Tall Cardboard Letters-Numbers Standup - Dino Rentos Studios, INC. Call us to order custom letters. 1. Letter Color : Select the color you want your letter to be printed in. You can also select Custom Color and we will contact you to review your color need. Or, you can select Use Image/Graphic to have your letters filled with a graphic, and we will contact you for the graphic. 2. Glossy Print: Glossy paper adds some shine to your letters. 3. Font Style: Select the font you want to use for your letters. Or if you want a different font, select Custom Font and we will call you to review. 4. Make Me These Letters: Enter the letters you want us to make for you. We will cut as you enter the letters, so make sure you use upper case and lower case as you intend the final product to be. 5. Quantity: Enter the number of letters you typed in the "Make Me These Letters" box. For example, if you entered the letters "SALE" you would select Quantity (4). NOTE: All cardboard letters are folded for shipping cost effectiveness. Please contact us for unfolded freight options.